Fall fashion is finally almost upon us! From the warm autumn hues to the incorporation of outerwear, Fall has always been my favorite season for both the weather and its fashion trends. Although the sunshine in Florida doesn’t seem to have any plans on exiting any time soon, I couldn’t resist bringing in a piece of Fall into my look by sporting one of my fave light-weight duster coats. This simple look is perfect for a day out with the girls or a late lunch with your significant other. Looking to take a minimal look up a notch? 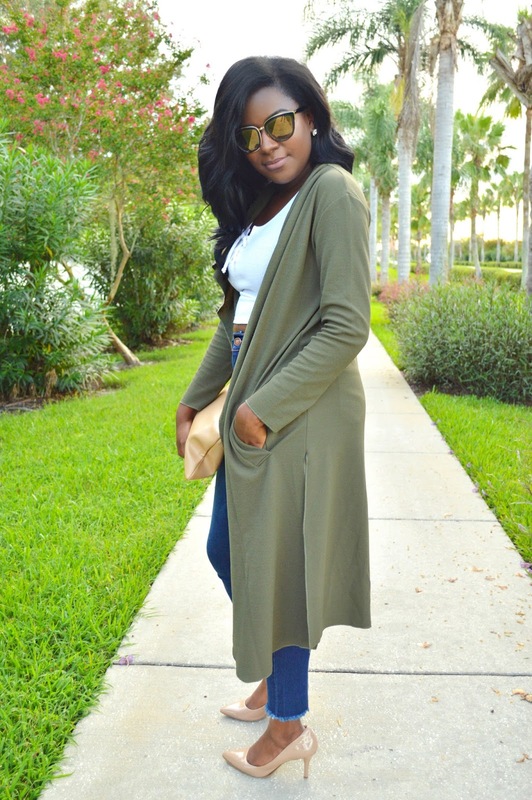 Try adding outerwear such as a duster coat or a long line vest. They are perfect ways to add a sophisticated touch to your outfits while also adding dimension. I personally can’t wait to add more outerwear to my collection, especially those made of heavier fabrics for winter traveling purposes. Are any of you all excited for Fall as much as I am? Let me know your thoughts!